Footage of police officers body slamming a 22-year-old girl as they arrest her after she allegedly hit one of the officers. Michaella Surat was attacked by police outside Bondi Beach Bar in Fort Collins, Colorado on Thursday night after bar staff called 999 over an alleged fight involving her boyfriend. It’s being reported that as she tried to pull her boyfriend away from the fight she became involved in the fracas herself, struggling against an officer who was holding her by her forearms. As she struggled against the the policeman he threw her to the ground and as she tried to get back up the same officer and his colleague forced her down. People in the bar recorded the shocking attack and the footage has since hit the web with many criticising the officer involved for his heavy-handed tactics. One user wrote on Twitter that the cop was ‘out of control using excessive force on a student’. Others however praised the officer saying: ‘Looks like she didn’t follow the officers instructions and he did his job perfectly’. The video’s been watched by more than 8,000 people on Instagram and Twitter since it was uploaded by the official Bar Stools accounts. 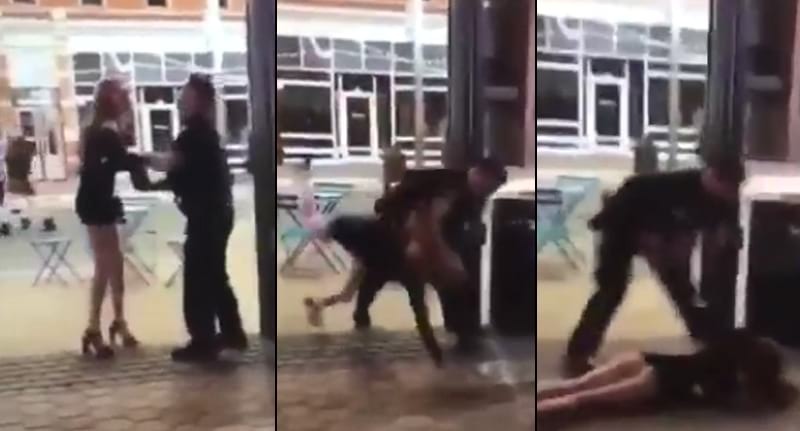 Despite the criticism of the tactics used by the officer the Fort Collins Police have claimed this was the standard procedure when dealing with a suspect accused of assaulting an officer. Surat was booked into Larimer County Jail and charged with third degree assault as well as obstructing an officer. She will appear in court on Wednesday. Investigators will review body-camera footage taken by the police as part of the investigation.